There’s a certain formula to every good living room arrangement. And central to that formula, more often than not, is a well-selected coffee table. Whether classic in design, or more innovative, coffee tables are a living space staple. They’re also something we often take for granted. So when it comes time to choose one, it’s not uncommon to find yourself faced with a challenging choice. Luckily, when you break it down, the decision is not a hard one. Despite the large number of coffee tables on offer, there’s always going to be a perfect one for you! 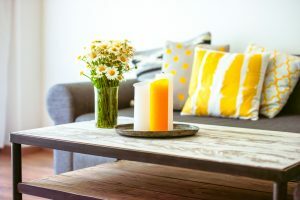 To help you find your perfect coffee table, we have put together this list of handy tips and tricks for choosing a coffee table. Choosing a coffee table means choosing a design. The design you choose is really a matter of preference. But if you find yourself struggling to decide, we suggest starting with ones that suit your current décor. Chances are, your living room runs on a theme to at least some extent. Even subconsciously, we are all drawn to thematic design choices when we set up our living spaces. So ascertaining precisely what that design is will narrow down your options significantly. Not every living room has entirely consistent décor, though, so don’t feel bound by theme! If you prefer an eclectic collection of furnishing, you may need to narrow down your options with a few of our other tips. As with all furniture, coffee tables serve practical purposes as well as aesthetic ones. Those purposes should definitely make an appearance when the time comes to choose a coffee table! If you have a hefty collection of magazines or books that you like to keep in the living room, storage might be a defining factor for you. Then there’s flooring. If you have timber flooring that is prone to scratches, some heavier coffee tables may be a bit risky. Small details like that can really make or break your satisfaction over time. So before you rush to a decision, think carefully about how each design of coffee table will serve your practical needs. The two most common materials used in coffee tables are timber and metal. Both are great; they’re durable, attractive, and diverse in design. So how do you choose? Again, looking to the décor of your home is important here. Timber and metal normally fit in well with decors of similar appearance. But another thing to consider is the environment. Metal can rust – even indoors. That means certain environments mightn’t suit metal coffee tables quite as well as timber ones. For example, homes proximate to the sea can experience rust a little more than inland homes. Even so, you’re likely to get a good rust free run out of a metal coffee table if you care for it well. If you’re living room is calling out for a coffee table – the final piece of the puzzle – then the urge might exist to buy one asap. Our advice: resist the urge until you’ve got clear measurements! It might seem like a rookie mistake, but choosing the wrong size can happen to any of us. That’s why the tape measure should make an appearance before your visit to the furniture store! Often, choosing a coffee table is one of the last steps to a renovation project. It’s also the perfect opportunity to polish your new living room to perfection. To ensure that you nail it the first time round – remember coffee tables can be expensive – we recommend some expert input. Teaming with some design pros will leave you with the perfect coffee table – the crown jewel of your new living room.